Cities in color is a one-piece jigsaw puzzle series featuring some of the most amazing cities of the world colored in bright, bold hues. 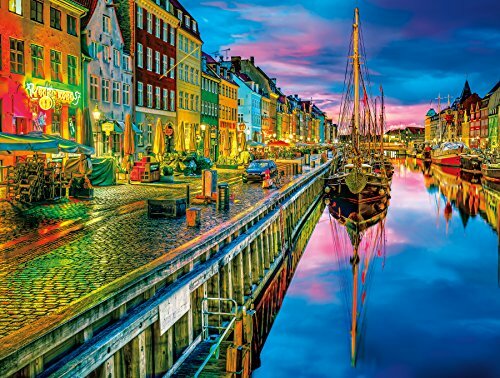 This puzzle, Copenhagen, based on the photograph by Jacob surland, features shops and ships at Twilight along a beautiful Danish canal. Surland lives in Denmark and is a member of the best top photographers and a member of the Arcanum, magical Academy of artistic mastery. Every Buffalo Games jigsaw puzzle is manufactured in the USA from recycled puzzle board. We use a precision cutting technique that guarantees every piece will fit perfectly with our signature perfect Snap. A bonus puzzle poster is also included so that you have a handy reference of what the completed puzzle should look like while you put yours together. If you have any questions about this product by Buffalo Games, contact us by completing and submitting the form below. If you are looking for a specif part number, please include it with your message.